Find Proshares S&P 500 Aristocrats ETF (NOBL) review. This exchange traded fund invests in companies which provide consistent high dividend. S&P 500 dividend aristocrats are S&P 500 companies that have increased their dividend payouts for past 25 years. There are currently 51 companies which fit this category. Top 5 high yields companies include AT&T (T), HCP (HCP), Consolidated Edison (ED), Cincinnati Financial (CINF), and Leggett Platt (LEG). AT&T has the highest dividend yield of 5.76%. You can invest in these stocks to earn high dividend income. 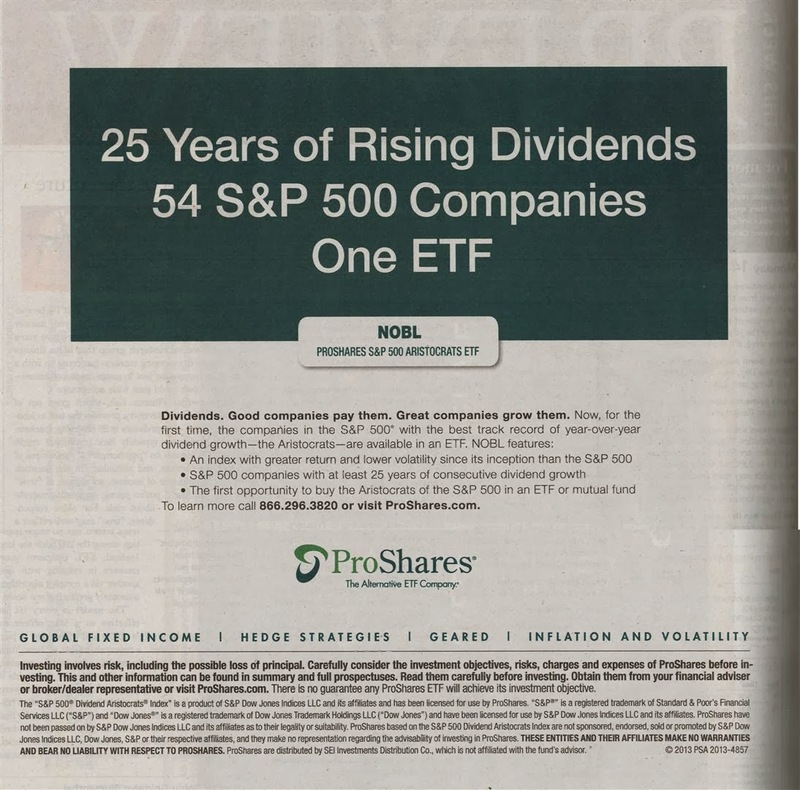 Recently, Proshares has introduced a new unleveraged dividend ETF. Proshares is popular as a leveraged investment funds provider. This exchange traded fund uses a benchmark that is looking to focus on S&P 500 components that have increased dividends every year for at least 25 years. This high dividend fund is giving a focus on companies that have among the strongest balance sheets and put increasing yields at the top of their priorities. While most of the companies in the index pay dividend, it is important to remember that many times these companies don’t pay out the largest yields. The current index has a benchmark yield of nearly 2.6%. The main goal of investing in this Proshares S&P 500 Aristocrats ETF is to seek investment results, before fees and expenses, which track the performance of the S&P 500 Dividend Aristocrats Index. This high yield fund was introduced to public in October 2013. It also has $99.01 million of total net assets. The fund is currently traded at premium 0.05% from its NAV. The CUSIP is 74348A467. The current YTD return of this dividend fund as of February 20, 2014 is -2.40%. Because the fund is still new, it has no Morningstar rating yet. It has 2.21% dividend yield as of 2013. The recent dividend was distributed in December 2013 ($0.13). You can buy this ETF for your brokerage or retirement account (Roth IRA or traditional IRA). The top 7 stocks in its holdings are VF Corp (2.19%), Cardinal Health Inc (2.11%), Archer Daniels Midland Co (2.05%), Pentair Ltd (2.02%), Exxon Mobile Corp (2.01%), 3M Co (2.00%) and AbbVie Inc (2.0%). The top index sector weightings are Consumer-Non-Cyclical (39.81%) and Consumer, Cyclical (16.13%). This ETF is relatively new. You should only invest if you have high interest with the S&P 500 dividend aristocrats. 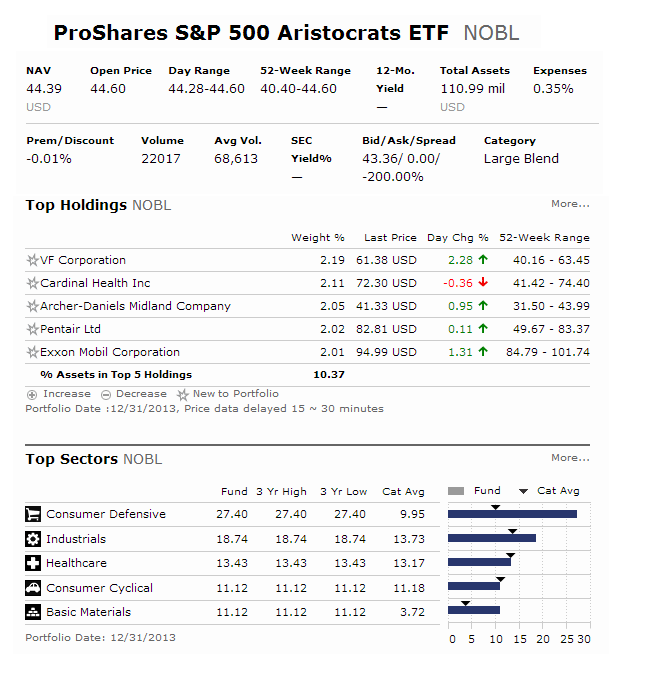 This Proshares S&P 500 Aristocrats ETF (NOBL) do has a low expense and great for long term.